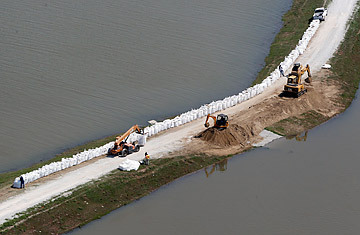 Workers top a levee with sand bags near the Mississippi River near Morganza, La., Monday, May 9, 2011. Leigh Ann Heinse can't help but feel nervous right now. Two years ago, she and her husband purchased what they believed was their forever home, a four-bedroom fixer-upper in a kid-friendly subdivision in Baton Rouge, La., a half mile from the Mississippi River. Though the river levees are visible from the entrance to her neighborhood, Heinse says she and her husband did not buy flood insurance  it is, incredibly, not required  "because It was one more bill that we wouldn't have to worry about." In a region where memories of Hurricane Katrina are still fresh, these threatening waters have opened old wounds. Since Katrina hit Louisiana in August 2005, flooding more than 80% of New Orleans with water and Baton Rouge to the north with evacuees, the U.S. Army Corps of Engineers has spent billions of dollars to repair and strengthen the region's levee system. Although authorities have said levees will be able to hold up against the Mississippi's surging waters, officials are still concerned because the swollen river is expected to tax the levees for the next week and a half. For former New Orleans resident Burma Smith, the rising water is bringing on sinking feelings. Smith, 63, and her husband moved to Baton Rouge in 2007 after losing their home in Katrina and trying  but failing  to start over in the Big Easy. The home Smith found upriver was almost identical to the one she lost, she says, adding that she "needed a place like this in order to heal." Still, with successive hurricanes that have hit the state and last year's BP oil spill, Smith says she watches the news and wonders when Louisiana will ever get a reprieve from natural disasters. "Right when you think things are starting to feel normal, then there's this water coming down from the upper Mississippi, just flowing down here, and it brings it all back," says Smith. "Psychologically it's another rollercoaster." Late last week Governor Bobby Jindal asked President Obama to declare a state of emergency in advance of possible flooding similar to what hit Memphis, Tenn., so badly this week. The Army Corps has attempted to decrease the river's flow by opening part of the Bonnet Carré spillway, located some 30 miles upriver from New Orleans. The spillway relieves pressure on the levee system by diverting river water into the Gulf of Mexico via Lake Pontchartrain. Another spillway, the Morganza, may be opened by this weekend or early next week. But if it's opened, it's expected to unleash at least 12 feet of water in Morgan City, southwest of New Orleans. Heinse says some of her neighbors have already noticed their yards are bubbling. Others have purchased flood insurance even though it won't go into effect for another 30 days. Local energy companies are asking customers to conserve, since outages are possible with the floods and 90-degree Fahrenheit temperatures. Local governments in vulnerable communities are offering sandbags to protect homes. Thunderstorms are forecast for the end of this week. Eight thousand acres of land have been flooded around the nation's largest maximum security prison, Louisiana State Penitentiary at Angola, which is north of Baton Rouge and home to 5,200 inmates. On Monday morning, 192 prisoners with health problems were taken out and more than 1,000 will be evacuated throughout the remainder of the week, according to spokesperson Pam Laborde. Prisoners have spent the past week filling sandbags and tossing them on top of the 12 miles of levees surrounding the unflooded areas of the prison. Tents have been set up near the higher ground of the prison's front gates in case remaining inmates are forced out. Buses are on standby if prisoners need to be sent to other facilities. Downriver, Heinse, a real estate agent and mother of three, has her own evacuation worries. "This is about my kids and their sense of security," she says. "I taught kindergarten during Katrina, and I remember how [evacuee] children were so distraught at the simple thought of coming into a new school, especially after having been rescued from their homes by a helicopter or boat. I don't want my kids to experience that feeling." Heinse says she's "no stranger" to the region's tragedies, "but I've never been faced with this much of a potential threat before." For now all she can do is sit, wait and hope that the nearby levees protect her forever home. See the most influential people in the 2011 TIME 100.